Relentless in their search for innovative gaming, King is always on the look out for new hits. After last month’s releases of the surprising ARPG Hero, and the third part of Bubble Witch Saga, now they’re at it again with yet another variant of Candy Crush. Bearing many similarities when it comes to gameplay, this time an extra twist was added by attributing the game with an identity that’s all it’s own. In SkyBright Saga the sky’s the limit, literally. The aim of the game goes further than being the umpteenth match-3, by adding some original actions. Take for example, when you rack up four or more of the same kind of stars you’ll earn yourself a shooting comet aimed in the direction that you’ve moved in last. This system allows for a whole new horizon when it comes to challenging players by freeing up access to breaking blocks from previously impossible angles on the game board. In terms of progression, there’s nothing new under the sun. Levels are faced and beaten sequentially including a limited number of lives and opportunities to repeat each challenge. If you run out of these you’ll need to wait for a few hours before playing again or rely on those vexing social actions taken on Facebook and well-hated by so many, in order to obtain new chances. 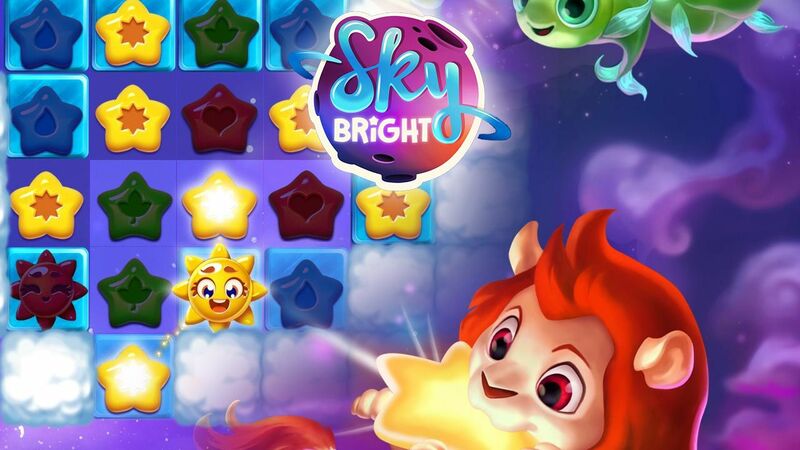 SkyBright Saga hasn’t been fully released internationally yet, but premiered recently via soft-launch. Available until now in just a handful of countries, now uploaded in APK format on Uptodown allowing users to instal and run from anywhere regardless of their geopolitical location.